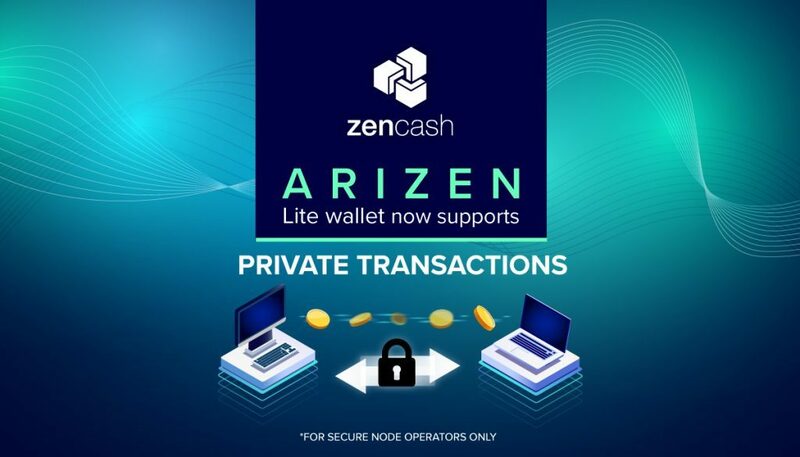 ZenCash has released an update to the Arizen API wallet. The update allows Arizen to support Z Addresses and Transactions for Secure Node Operators. Users who already have Arizen installed will automatically be updated to v1.1.7. Users who have not installed Arizen can download it from ZenCash’s GitHub. Send Z-Z and Z-T with your secure node. In order to be able to send Zen to a Z address, your secure node details will need to be set in your settings. Secure Node operators will also have added items in the settings menu to configure the connection to their nodes. For instance, zend can receive RPC calls. Using these calls Arizen can receive and send Zen. Settings 3,4,5 are related to the RPC functionality. RPC calls are unencrypted, so to avoid any information leakage, an extra layer is used (SSH tunneling). Using settings 1,2,6,7, Arizen establishes an encrypted SSH tunnel to the secure node. So data is protected. forwardTimeout: How many millisecond to wait before reject with a timeout error. Use default 10000.
readyTimeout – integer – How long (in milliseconds) to wait for the SSH handshake to complete. Use default 10000. For the full list of updates included in this new version on Arizen, check out the Version History on Github.